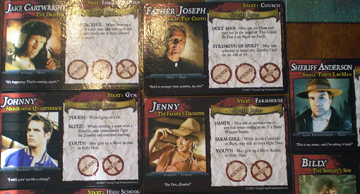 You take the role of either a small-town hero or a zombie horde in this survival horror board game. Each game begins with a team of four heroes—if you have 4 or fewer players, some players will have to play more than one hero—and the zombies are controlled by 1 or 2 players. The players pick their heroes—I prefer a blind draw for this so you get some odd hero choices—or color of zombie horde (one horde’s brown, while the other’s green), and then you choose or draw a scenario. 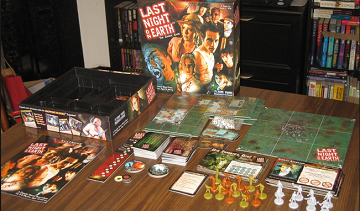 While there are only five scenarios, each game of Last Night on Earth varies, because you’re playing on a modular board, which changes the layout of the town and start positions of each hero. 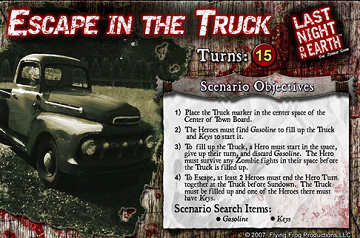 You may find yourself burning down the barn or escaping in a truck or going berserk and trying to kill as many zombies as you can before the sun rises. There are two decks—a hero and a zombie deck—that give tactical bonuses to each side. Players resolve combat by using 6-sided dice, but you can find a weapon in the hero deck, and that weapon can modify your combat roll. I never saw my cousin turn that red, and my son couldn’t stop laughing. You’ll find other fun tropes in this epitome of a thematic game. I’m not sure there’s a whole lot of strategy to this game—just a lot of dumb luck—but it doesn’t matter. If you have a love of horror or zombie films, you should give Last Night on Earth a shot. Verdict: An enjoyable thriller of a thematic game that changes gameplay each time with its scenarios and modular board. The missions may be straightforward, but you shouldn’t care. It’s all about playing in a zombie movie.